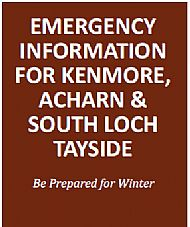 See docments (Community Resilience) for downloadable Brochure on Emergency Advice. Wildfox Events (David Fox-Pitt) have 4X4 vehicles and a lot of emergency equipment. They are also willing to pick up provisions or prescriptions or lifts to surgery if needed in this weather. Contact: via Home 01567820409 or Mobile 07710446332. Enerfoil Ltd are also available for similar support. Contact: Ewan Weir 01887822999 or Mobile 07734078851. Shirley Shearer 01887822999 or Mobile 07860276188. See document for Comunication arrangements and key contacts. The agency is advising that you visit their Live Flood Updates webpage (click here) for more information on Flood Alerts and Warnings in force. If you live in an area that is prone to flooding and you are not yet signed up to Floodline to receive updates direct to your phone, visit sepa (click here) or phone 0345 988 1188.